I thought this event was pretty new because I'd never heard of it before, although I had only just started paying attention to F1 events. It turns out that this was the first ever GP Live event, the inaugural one, and Sidepodcast was there. Unusually, we got there early. We were prepared and organised and decided we would get up early and beat the traffic. 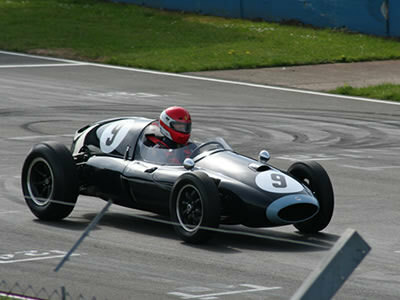 We were arriving at Donington Park at about 9am. And there was no one else there. We were one of the first people to arrive, there were literally only about five cars parked ahead of us. It wasn't at all obvious where to go or what we were supposed to be doing. We could hear where the track was, but there was no indication how to get anywhere near it. And of course, there was no one else around to follow! We wandered up and down the garages which was the only thing we could see to do, but it was actually very interesting. 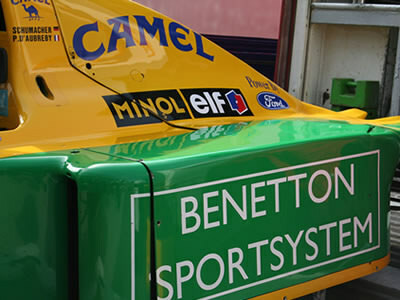 The owners of the cars weren't that bothered about the public having a good poke around in their garages, which is a refreshing change to the secrecy that usually surrounds motorsport garages. There wasn't a huge modern F1 presence, to be honest, but there was a year-old Red Bull tucked away in one of the garages. Eventually, we had to give in and ask where we were supposed to go and it was only through that enormous tunnel. How could you miss it? We scuttled through and there it was, the track, the grandstands, everything. Hallelujah! We watched some of the races, and they seemed to be organised into decades, but we're not that knowledgable on the older cars. There was a rather fabulous demonstration of Cosworth engines to celebrate their anniversary. About twenty Cosworth powered engines lined up on the grid and then they all fired up and went off at the same time. It was so loud and rumbling and an absolutely incredible sound. The programme said there were supposed to be 40 cars, and we saw just half that, so god knows how deaf we would have gone if all cars had been in attendance. Wandering around the track, we watched the cars through the years, I really liked the 1970s race. It's so much more interesting to see the cars actually racing rather than stuck in a museum. When we visited the Donington Grand Prix Collection, it was just row after row of cars, and you have to use your imagination. This way, you get to hear them, see them, and quite disgustingly, smell them. Diesel. Yuck. Anyway, we knew there was a section that would hold the Adrian Newey Collection, the RB3 and the merchandise stands, but we were having no luck finding it. There was a serious signpost problem, the map in the programme was wrong, and it was really quite frustrating. Again we had to ask someone where we should be headed and the security guard on the gate said the RB3 had packed up and gone home. Gah! I stomped off in a huff. At this point, we walked round the back of the track, towards the paddock again. It was blatantly obvious that Donington could never hold a Grand Prix. The facilities are basically non-existant, they can't seem to get any kind of signpostage going, and a visit to the, uh, bathrooms, left a lot to be desired. Of course I could have just been sulking about the RB3 going home. Having reached the paddock, we were wondering what to do next, when I spotted a very short man shouting about a minibus service to the exhibition centre. My ears pricked up. What's that? So, we jumped into the next shuttle bus and travelled 5 minutes away to the exhibition centre. It was so obvious when we got there. 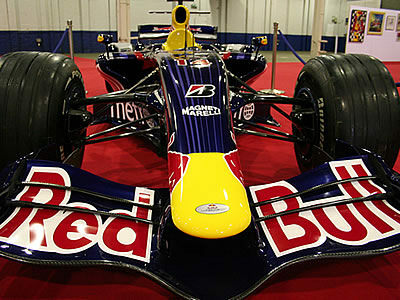 This is where the RB3 and the Adrian Newey Collection would be. Of course! I don't know why they put the centre in the middle of the track on the map when it was quite obviously half a mile away. That's me and the Honda. It was a bit random really. There was a row of five cars, that we stared at for about ten minutes, before realising the connection. 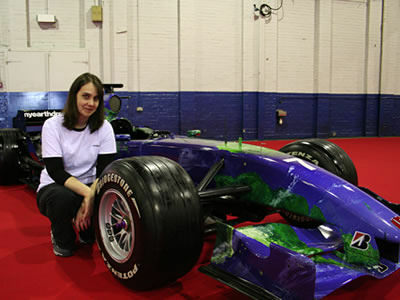 They were all made by Adrian Newey! It was interesting to see what parts of the cars he changed through the evolution of his designs, and what things he kept the same. It would have been nice if they'd have given us a bit more information about what we were looking at. If I hadn't been with the Geek (could be his new name?) then I wouldn't have had a clue. The only way to describe this car up close is that I refused to have my picture taken with it because it would make me look ugly. After drooling over the car for a while, we mooched around the merchandise stands but didn't buy anything because it was all historic stuff. Then we spotted a crowd gathering, so we grabbed a seat at the front and waited. It turns out we were anticipating an interview with Tony Brooks and Stirling Moss, done by Martin Brundle. The interview began, Martin was a bit late, but made up for it by being very good at his job. He also wasn't phazed when his son just appeared out of nowhere. His son seems pretty smart as well. Mr C had been wearing his Renault hat - the one that they gave away free when he joined the Renault club. The one that they have to give away free because no one would want to buy it. For some reason, and completely out of character for us, we decided to queue up and get the hat signed by the Brundles. We also got our programme signed by Moss and Brooks. There was not much else to do after that, so we took the shuttle bus back, and went home. Conclusion: Not enough direction. I think the idea is great but it might be difficult to market because the old cars don't appeal to everyone, and there's not enough new cars to bring in the fans like me. Apparently the crowds weren't as massive as the organisers had expected, but they still seemed pretty chuffed. They're planning to take it to other countries, as well. All in all, it was a good day, but I am still convinced that F1 drivers need to start making more appearances for the fans.